Welcome in our WKF SANDA-WUSHU division ! FOR MORE UPDATES CLICK HERE !!! 2020 first time in history on the African continent ! 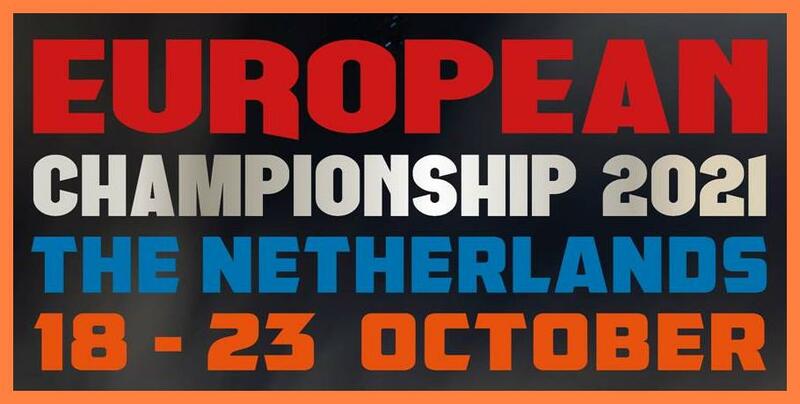 The Dutch WKF team is working hard for the European Championship in Baia Mare, Romania. It will be held from October, 21st to 26th 2019. Athletes of the Dutch team will participate in various disciplines. The Dutch team also have referees who are going to take part of The World Referee seminar. 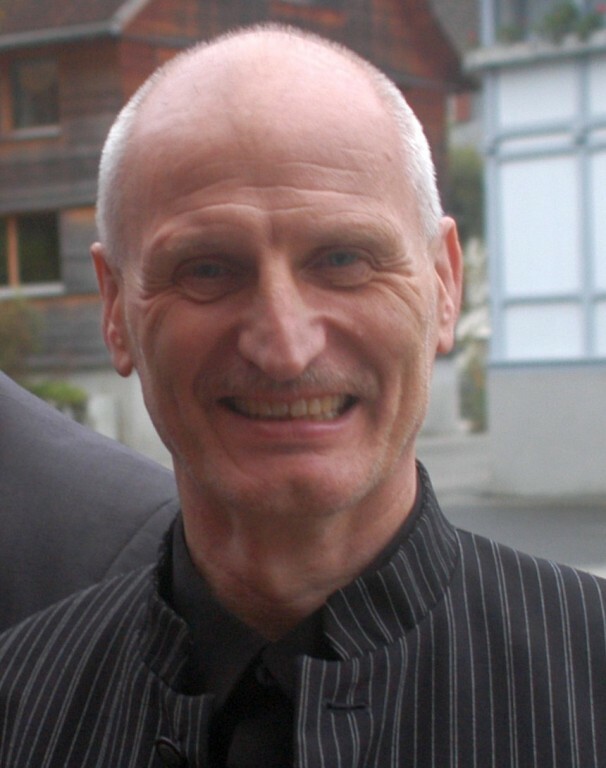 The Team is led by the WKF Dutch President Sijou van der Spek. For kids under 13, juniors under 18, adults 16-35, veterans 35 -40 and masters 40 +: Forms, Semi contact, Light contact. For adults 16-35 Years: Kick light, Full contact, Low kick, K-1, Thai Boxing, Sanda, MMA. Don’t wait any longer. Join the best and biggest organization of the world and be a member of the WKF. WKF – World Kickboxing Federation – is one of the greatest and World wide sanctioning body for Kick boxing and MMA in amateur and pro. On our web site mma.wkfworld.com you could find all important facts and news about MMA in our World sanctioning body. More than 5000 hits per month is the result of serious and hard work. 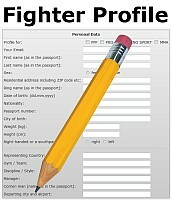 Just fill in the new online fighter profile here, add a jpg photo and we will post you in our MMA rankings, European or World ranking. Open for all teams and countries, invitation and all details here online ! This is our perfect test for the official WKF World championships 2022 in Haikou, Hainan, October 16th -22nd. Following our many members from all over the World, WKF head office started now with a new SANDA & WUSHU division. This includes all Sanda male/female fighters, fill in the online profile, add a jpg photo to be listed in the SANDA World ranking. For professionals we offer same SANDA title belts like in ring sport or MMA. 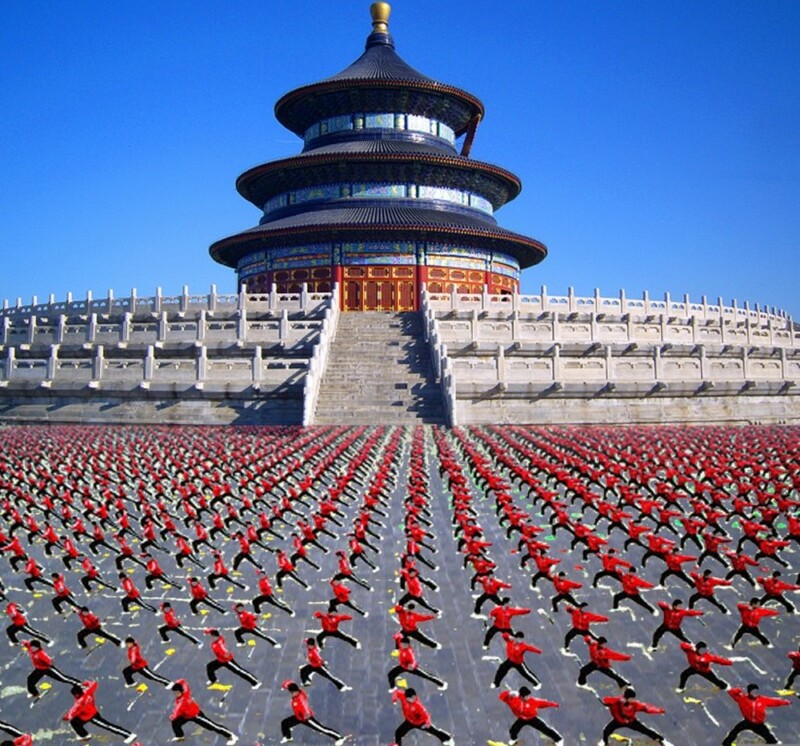 For Wushu we have our WKF Wushu forms and many more ! The World Kickboxing Federation is one of the leading organisations World Wide in the promotion of amateur and professional kickboxing in all styles, Muay Thai and MMA -mixed martial arts hosting professional fighting events. Our modern and interactive approach to this sport highlights our commitment to keeping you updated with the latest events taking place worldwide. The WKF SANDA & WUSHU DIVISION was formed in 2015, the WKF stresses its strong belief in offering equal opportunities to sufficiently skilled athletes who have practised Kickboxing, enabling them to display their talents in the National and International Amateur and Professional arenas. Also to ensure the credibility of their “world championship” titles and gives these world class athletes an international platform on which to perform. 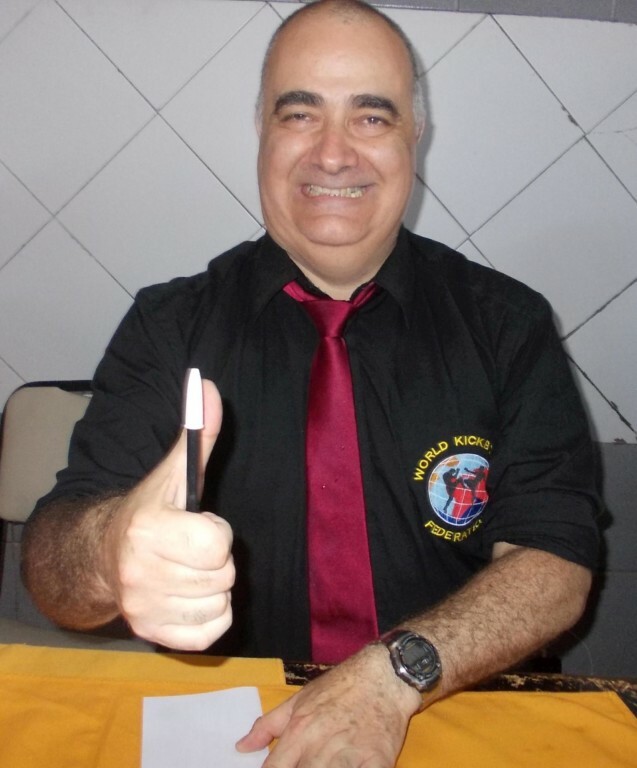 Posted in Uncategorized | Comments Off on Welcome in our WKF SANDA-WUSHU division ! My name is Fernando GUERRERO and since last World congres in Buenos Aires I am new World director for PPF – Pro Point Fighting. I’m from Santiago de Chile and I’m now responsible for the development in PPF. Together with the best point fighters in the world, I want to continue the high standard and improve it with YOUR help. I look forward to receiving your inquiries by e-mail in English or Spanish in my PPF World office. Welcome in our WKF PRO POINT FIGHTING division. The idea behind is to upgrade our World wide best Semi contact and point fighter, to give them a chance to fight on a special event, for a special title and a special belt, as main fight on the event. The fees (on request) are fair, the rules are clear, the conditions easy. World Kickboxing Federation sanction World wide continental, Intercontinental and World Champion titles for adults, man and woman. Like in ring sport just send fighter profile and photo of your top class point fighters and we post them in the World ranking. Have always a look on our updated pro point fighting ranking and event schedule, many downloads, gallery and much more on WKF Pro Point Fighting , just have a look. 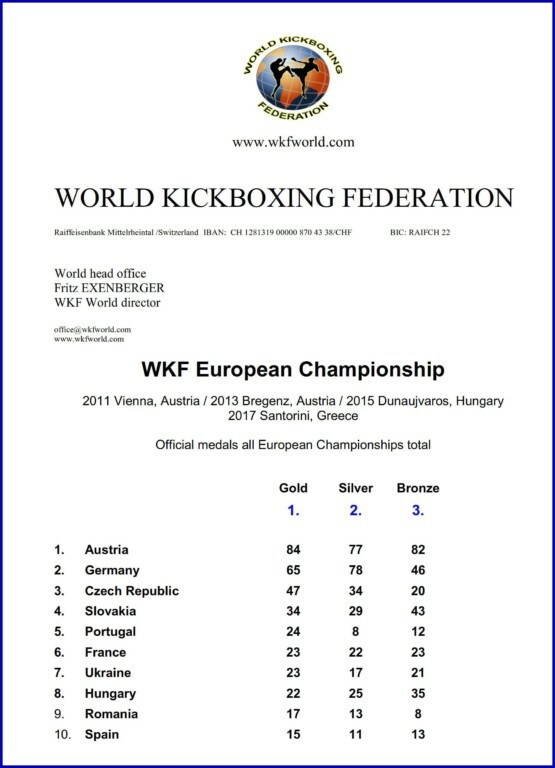 WKF TOP TEN Countries in Europe ! 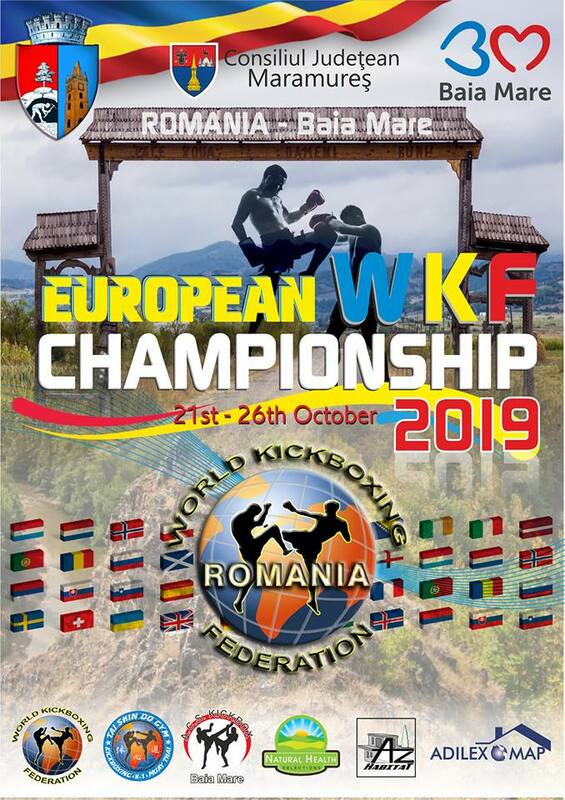 European Championships 2019 in Romania ! All results, country medal rankings and “Grand Total” medal ranking of all European and World Championships are HERE online, waiting for your down load. 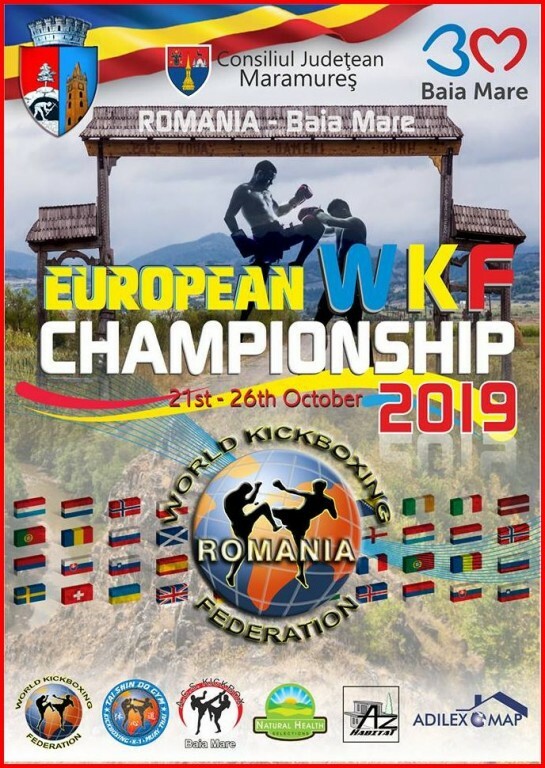 Posted in Uncategorized | Comments Off on WKF TOP TEN Countries in Europe ! 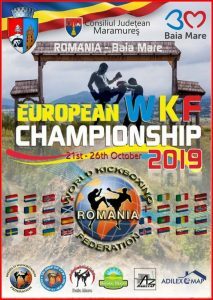 European Championships 2019 in Romania ! Registration deadline October 4th, 2019 ! Invitation is here ! 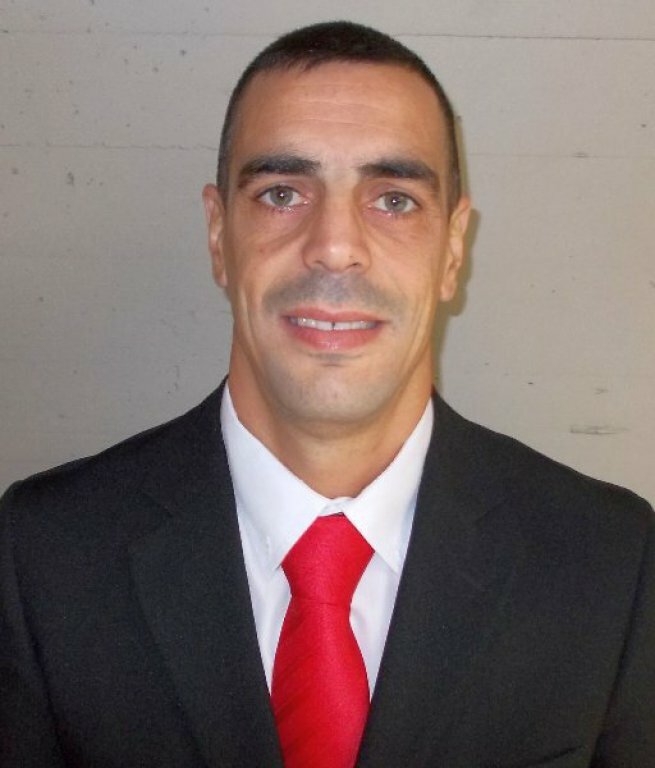 For details about the World seminar, Visa invitations, any requests about airport transfer, Hotel booking and more contact our WKF ROMANIA organising team Mr. Florin MINA by mail ! 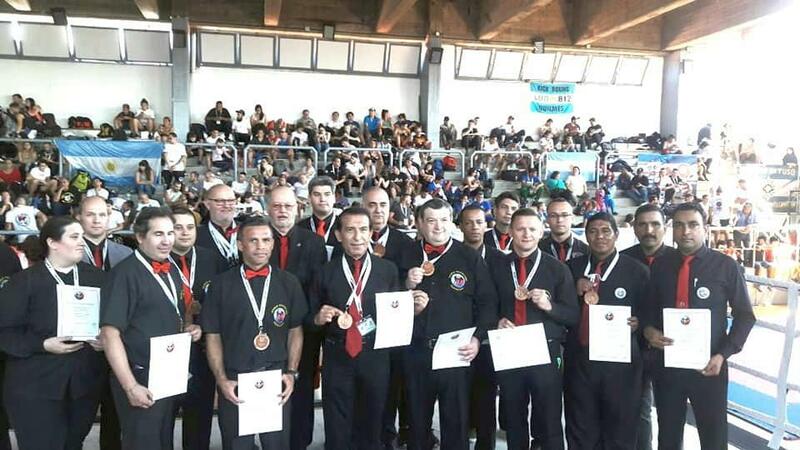 All International WKF referees, who not has attended the last seminars in Santorini 2017 or Buenos Aires 2018 must extend their license 2019 in Baia Mares. The extended license is valid for three Years again. without valid WKF license you are not qualified for WKF events ! 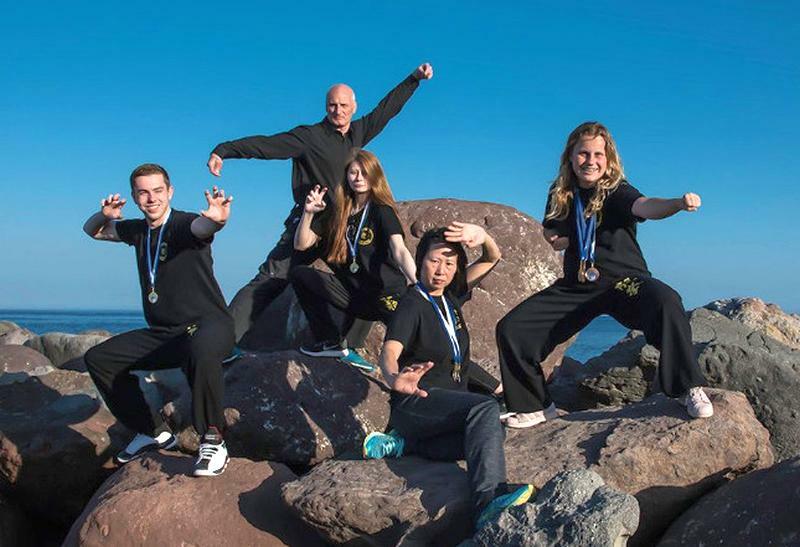 On the last World Championships in Buenos Aires, Argentina, we had a small but very strong team from Australia. Photos here ! First time in history since 1964 (!) Australia made a gold medal -91 Kg / – 200 lbs in low kick. Rustam ATTAI from Sydney beat Argentinian Champion Fabrizio FORNESI in the final. 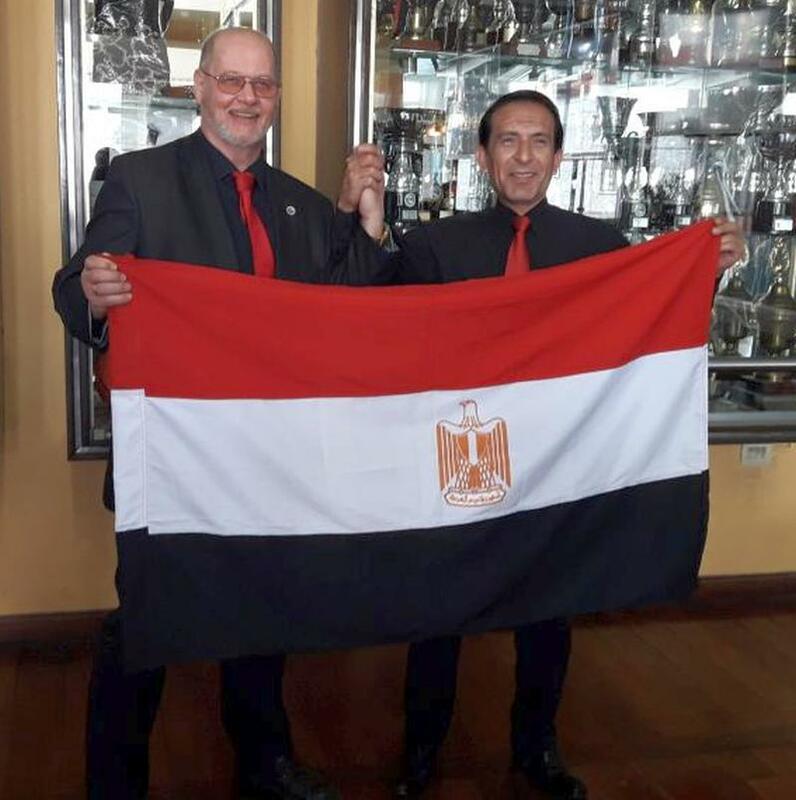 On the World congress in Buenos Aires the board of directors vote unanimous for Mr. Rustam ATTAI as our new continental director for the Australian and Oceanian continent. We would like to congratulate Rustam Attai for being appointed as the new WKF President for the australia and Oceania region. Rustam is also an active fighter and lawyer. Fighters and promoters, please contact Mr. ATTAI for events. 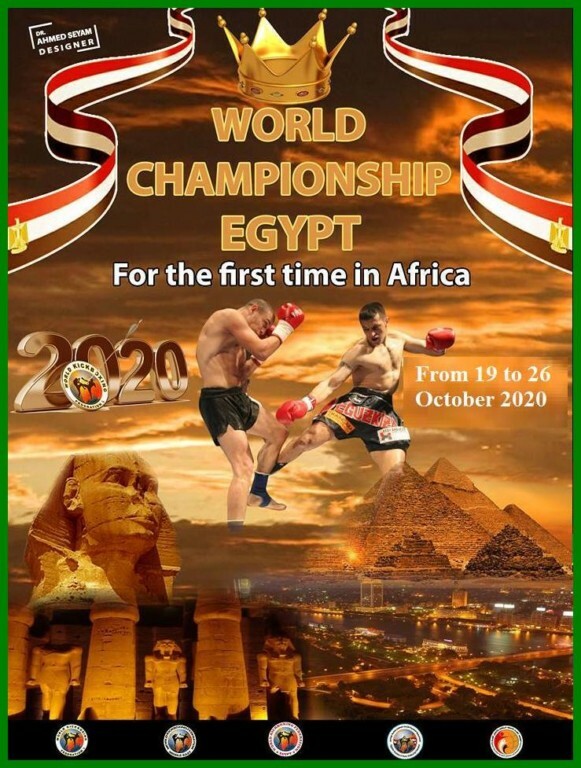 World Championships 2020 in Cairo – full invitation now online ! 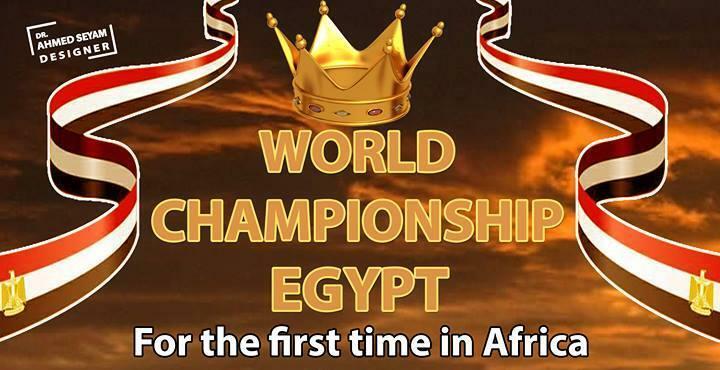 Posted in Uncategorized | Comments Off on World Championships 2020 in Cairo – full invitation now online !